American Originals: Northwest Ohio's Polish Community at Home, Work, Worship, and Play is another in a series of books examining Toledo's ethnic heritage published by what has become the University of Toledo Press. Previous books in the series include Hungarian American Toledo: Life and Times in Toledo's Birmingham Neighborhood (2002), The Irish in Toledo: History and Memory (2005), and Arab Americans in Toledo: Cultural Assimilation and Community Involvement (2010). "This [book] is a mix of the broader themes that have shaped our community with the actual lives that Polish-Americans recall - sometimes remembered with pain, more often with joy, and always with respect for the accomplishments of the families, friend, and neighbors. These are the histories of true American originals, who found a proper home for their ideals in the Polish-American community of northwest Ohio. May God bless our ancestors, who worked so hard to help us achieve our goals." "So, at the turn of the twentieth century, our grandparents on both sides took fateful journeys that were to change the course of our family history forever ... Poles from Poland, and Polish-Americans, value their histories because we know the price of our very existence." "Local book explores Northwest Ohio’s Polish heritage"
by Tom Konecny at the Toledo Free Press. "UT Press publishes book on Toledo’s Polish community"
at the UT News archive. 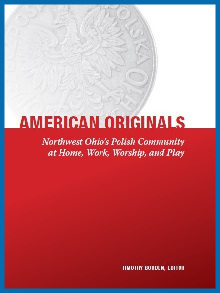 American Originals: Northwest Ohio’s Polish Community at Home, Work, Worship, and Play edited by Timothy Borden, is an essential volume to those interested in Toledo area history, or even the Polish history of immigration to the United States. The first chapter, written by Rep. Marcy Kaptur, tells an engaging narrative of her connection to the culture and what it means to come to the land of opportunity, and what it meant for those who were able to leave before the events of WWII and the rise of Communism compared with those that stayed behind, which she witnessed first-hand. The book is rife with historic photographs of Polish Americans, their place in the local religious community, and interviews with local Poles. It illustrates some of the influences on modern culture that Polish immigration had on the area as well as the United States in general. If you’re looking to learn more, feel free to contact us here at the University of Toledo Press. A Toledo native and a second generation Polish American, Dr. Timothy Borden earned his AB in economics from Brown University, an MA in history from the University of Toledo, and a PhD in history with a minor in Polish literature and language from Indiana University Bloomington. In addition to earning the Joseph Swastek Award for the best article published in Polish-American Studies in 1999, he was named a Distinguished Graduate of the Federal Law Enforcement Training Center in 2003. His work has appeared in Labor History, Michigan Historical Review, Northwest Ohio Quarterly, and The Organization of American Historians Magazine of History. After a childhood partially spent in the alleyways of Kuhschwantz and Lagrinia, he currently works in the field of international relations in his adopted hometown of London, UK.